Situated right in the town centre, I played in this park so much as a child and, as you might imagine, it’s changed hugely since then. Entering from the town centre side you will first of all encounter that most modern of park additions, the skate park, often filled with toddlers attempting to run their scooters up the ramps. Just beyond that is the large playground, with plenty of equipment no matter how old your little ones are. To the side of the playground is a kiosk selling drinks and ice creams and there’s a small picnic area there too. Continuing through the park you’ll come to the fairly extensive gardens, really well maintained and lovely to walk around and find a shady spot under a tree in the summer. Another picnic area is next to the great animal centre, with rabbits, fish, mice and birds and also a great new activity centre. Aside from it’s convenience for us, it would make our list of favourites regardless. Situated along Bradford Road in Batley, this is a park that my wife introduced me to, having driven by it many times in the past. Again split into 3 areas, one of the key differences about Wilton Park for our boys, especially NJ, was that the café has an assortment of ride on cars and trikes for the kids to play on whilst you have a brew, something I haven’t really seen anywhere else. NJ loves it. There’s also often a land train that can give you a ride around the large pond and, with another great playground, this is a definite on our list of favourite parks. It’s also just a short walk through the woods up to the great Bagshaw Museum. 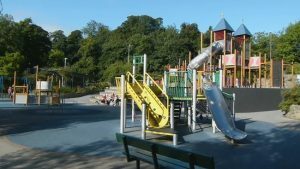 Coupled with a great walk around Yeadon’s expansive tarn, a visit here with toddlers and kids has to include calling in to the playground. The equipment is great and laid out in such a way that the kids run around between what they want to throw themselves off next! Duck feeding is also possible here and, on the opposite side of the tarn, a small area of picnic benches which we’ve made good use of in the past. A really great differentiator of this park is it’s proximity to the runway of Leeds & Bradford airport, and which small person doesn’t love the awe inspiring view, at fairly close quarters, of an aeroplane and the noise as it either takes off or lands. Parking is available either in the main car park off of High Street or further round off of Cemetery Road, which leaves you right next to the fab BMX track. Fair Warning: expect it be busy and difficult to park when the weather is good. 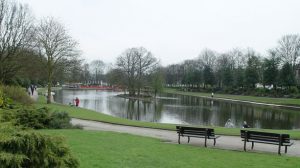 Easily accessible from the Leeds Ring Road Horsforth’s Hall Park is a great expanse of open space for running around. Parking just off of Fink Hill will drop you right at the doorstep of all that greenery. A little further on, and parking just off Hall Lane puts you in prime position for the parks playground and its unique sandpit. Yes, this is the only park I know of with a large sandpit, including a couple of climbing structures and a slide. There’s usually some little spades and buckets etc knocking around. The kids love it but be ready for them getting very sandy when they hit the sand box! 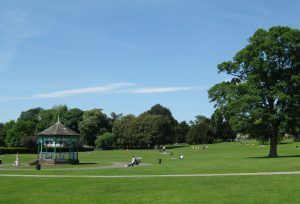 Where are you favourite parks? What makes a good park for you? Let me know in the comments. ← Living Arrows 19/52: Sunshine Funshine!